Flagship manufacturing SOMETHY, the pool of balneotherapy modular acrylic INTEGRA is ideally suited for use in indoor environments with water heated to over 30 °. The exclusivity of the lining 100% acrylic, we use over 20 years, has not denied the unique strengths that characterize it, in addition to simplified maintenance and improved hygiene, it withstands high temperatures without significant change its structure. It is standardized and has the label health. It is compared to other coating materials used in pool: insensitive to calcification (tiles), to osmosis (polyester: possible cracking of the gel coat) and distension (liner). In addition, our fabrication principle gives the pool an INTEGRA thermal insulation coefficient significant. 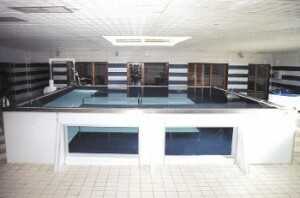 The modular panels enable the connection pool in existing facilities without major structures, the work of implementation is reduced. 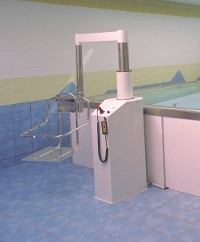 It was in 1978 that was created SOMETHY in Montpellier (France), dedicated to the study, research and manufacture of equipment for hydrotherapy. After three years of testing different coatings, the first modular acrylic pools were commissioned in 1982 and we are proud today to be able to provide our customers the LONGEVITY of our equipment because 95% of the first pools are still in service , more than 20 years later. Our technology equips today's most prestigious centers around the world our expertise is recognized and undeniable. True performance in hydrotherapy, swimming pools INTEGRA can be equipped with one or more display panels on the same side. The clear panels have substantial thickness, capable of withstanding the pressures of the most important. Perfectly integrated in the wall of the pool by a judicious assembly made of acrylic and composite materials projected, the display panel now allows a perfect control over the progress of an aquatic exercise, without loss or distortion of vision. This wonderful therapeutic tool has proven itself in many institutions. Among the many benefits conferred by the pool INTEGRA SOMETHY, there is one to remember: The ENERGY SAVINGS. Indeed, the coefficient K of the acrylic is 0.16 or, for example, nine times more insulation than concrete. The patient lifts POOLIFT are the last links in the great chain transfer in SOMETHY. Indeed, the system developed by the French manufacturer can take the patient to bed (or floor) and to accompany him without handling until the water body. It will move from a world dry (room and the corridors of the center) in a wet world (the shower, the pool area) without the health and safety are at a single point deficient.See for yourself! INTEGRA is connected according to your requirements either totally recessed, semi recessed or above-ground, the latter choice allows you to benefit from the panel "VISIO" popular and useful for the visualization of movements. It is important to emphasize that our construction principle allows to disassemble and reassemble the pool in another place even after several years of use, great advantage in the event of a change of premises. Whatever the model, SOMETHY pools are built to the same principles. The side panels of acrylic reinforced composite are also assembled an acrylic background it rests on the ground through plates rot with high insulation with a thickness of 80 mm. This thickness also has the advantage to accommodate the drain plug and allows what is rare in the pool, an optimal emptying the bottom. The side panels and bottom are then assembled via a stainless steel screws and a specially designed seal ensures tightness. Arcs self compensating dimensioned according to the model will then increase the rigidity of the whole supported by a curb to perimeter overflow gutter 316L stainless steel or composite materials. The pool will then be equipped with devices of activity you have chosen. Boasting the latest developments in hygiene and equipment, pools INTEGRA perimeter overflow channel to consist in the map.